The song was also recorded that year by English singer, Mark Wynter, whose release succeeded in reaching #4 on the UK charts. New Rochelle NY singer Bruce Bruno has also performed it. The song was written about Eileen Berner, whom Jack Keller was dating. ^ a b "Jack Keller", The Independent (11 May 2005). 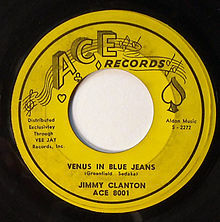 ^ "Jimmy Clanton > Charts & Awards", Allmusic. ^ Hall, Ron (1986) . The Chum Chart Book. Rexdale (Toronto): Stardust Productions. p. 32. ISBN 9780978234607. ^ Bruce Elder. "Mark Wynter > Biography", Allmusic. This page was last edited on 14 December 2018, at 04:38 (UTC).